Error: Error validating access token: Session has expired on Monday, 14-Jan-19 15:57:07 PST. The current time is Thursday, 18-Apr-19 15:17:01 PDT. CAD is mainly used for detailed engineering of 3D models or 2D drawings of physical components and it is also used throughout the engineering process from conceptual design and layout of end products, through strength and dynamic analysis of assemblies to definition of manufacturing methods of AV/IT components. Furthermore, many CAD applications offer advanced rendering and animation capabilities so engineers can better visualize their designs. MediaCentric will assist in your design, engineering, and review of both new and/or existing CAD designs to ensure workflow is smooth and the end result is exactly as expected. How Can MediaCentric™ Help You with CAD? Wholesale subcontracted assistance with integrating CAD models, components, and figures. Audio, Video and Information Technology Systems are the foundations of any successful business. MediaCentric uses proven consulting methodologies, combining a hands on approach and attention to detail, leaving no part of the AV/IT lifecycle process open for security risk. From business issue discovery, requirements collection, strategy development and company impact management, to design, procurement and execution, our consultants give you the means to align technological infrastructure with direction. With the MediaCentric consulting team behind you, you can rest assured knowing you’re leveraging the industry’s best resources and maximizing your investments. Tier 1 Support: Basic level support. Technical Operator gathers the customer information, analyzes symptoms, and determines the issue at hand. The issue is either resolved at this level or transferred to Tier 2. Tier 2 Support: Administrative level support. Admin assists Tier 1 with basic technical problems and reviews the work order to evaluate the status and duration of the issue. Specific information regarding the equipment and/or the application is gathered. Requirements may include diagnostic testing, physical testing or replacing of hardware before transferring to Tier 3. Tier 3 Support: Highest level support. Specialist provides assistance to Tier 1 and 2 with the issues documented as highly difficult or advanced. Previous tier work orders and resolution time frames are reviewed. New customer information and issues are documented and evaluated. If needed high level problems are sent to the original developers for in-depth analysis at critical stages to resolve the issue. 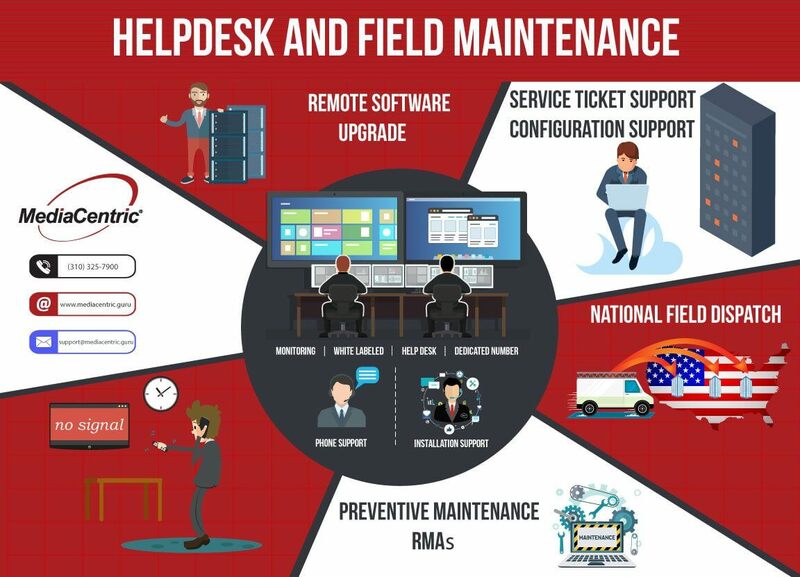 How Can The MediaCentric™ Help Desk Help You? Hours of Operation 8am—6pm PST M-F. Extended Coverage Available. Help Desk Operator: Live initial call within 5 minutes. Up to 1 hour response to start working the case. MediaCentric™ uses Salesforce Cases and Metrics for tracking Help Desk Cases. Detailed Reporting and Metrics Available. Extended coverage available for emergency support and after hours coverage. MediaCentric’s Help Desk expertise includes control systems, switchers, audio DSP’s, room integration, videoconferencing endpoints, gatekeepers, gateways, MCU’s, firewall traversal, VC management systems and networking products. We are always identifying new programming techniques to reduce development time while maintaining high quality programming. A seasoned expert in the area of video conferencing, MediaCentric™ offers services in a collection of technologies that integrate video with audio, data, or both, to convey communication and collaboration in real-time over distance, for meetings between dispersed sites. With network infrastructure certifications in Cisco, Polycom, Lifesize and Radvision, in addition to multiple years of experience, MediaCentric™ is highly adept with several generations of products and deployments in the video conferencing space. In addition, MediaCentric™ holds Cisco, Polycom, Lifesize, Vidyo, Sony, and multiple other codec certifications, in order to meet the needs of your video conferencing system. *MediaCentric™ is not a reseller. With over 150 years of combined AV/IT experience and knowledge, MediaCentric™ is a trusted industry resource and integrator partner. MediaCentric™ has grown through the years with the industry, gathering experience and certifications in various control systems including Crestron, AMX, Utelogy and Extron. In addition to control systems, MediaCentric™ engineers are well versed and certified in several audio DSP platforms including Biamp, Polycom, QSys, Extron, and ClearOne. A “best of class” independent professional services provider, MediaCentric™ offers technical expertise in video walls, maintaining certifications from industry leading manufacturer products such as Christie MicroTiles, Jupiter Systems PixelNet, and Fusion Catalyst and Planar Clarity Matrix. Christie, Digital Projection, InFocus, NEC, Pioneer, Samsung, and Sony, as well as dozens of other display manufacturers for projectors, plasmas, LCD’s, and LED products. Da-Lite, Draper, and Stewart screens and lifts, including rough and finish work in drop ceilings. Commissioning of system components, including video switchers, audio DSP’s and VTC codecs. Installation of field devices such as ceiling/surface mounted speakers, microphones and cameras. Cable pulls, terminations, wire looming, rack fabrication, and wiring. Structural installation and fabrication capabilities to install products suspended from any type of ceiling, or on any wall. Ability to perform minor carpentry and millwork modifications, depending on size and scope. Light fabrication as needed for special installations. New technology can be intimidating to use and interact with in the beginning. We can give your end users the training they need to feel comfortable using their new AV system. Even the best tuned machine will eventually break down or have issues if not properly maintained and/or not commissioned right during installation. We can diagnose issues to get your meeting space back in working order at various levels of complexity. We can represent you in the most professional manner and deal directly with your customers on your behalf. Network infrastructure that drives video conference has become somewhat of a niche. Our engineers have years of experience deploying Cisco and Polycom Telepresence.